I’m not one to read cookery books, when I cook I use ingredients that I can find and combine them. A few times the result is really good, most often ok and sometimes awful. So when I spied an article entitled “The Tyranny of Recipes” (1) I had to read it. It seemed like a recipe book in fact it was anything but – great cooks know their ingredients and how they combine and cook. The great traditions of cooking are instinctive and have become an ‘unconscious competence’. When a particular ingredient is missing, you put in something else and that is one of the ways that culinary delight progresses. Baggini’s article suggests that the massive growth in cookery books has disabled an intuitive sense of cooking, making us over reliant on an ever more precise set of instructions with the consequence that without all these “rules”, we can no longer cook. The issue is not really about cooking. Cookery is just a good example. The point being made is that we create recipes and rules such that when we’re faced with a particular situation we know how to behave. We don’t have to think about it, we follow the rule. Of course we need rules to help govern our interactions with one another, they are essential but we can take rule making too far and expect too much from it. Rules have an unintended consequence, a hidden pitfall, and that is we don’t have to think. In so much as life presents us with situations and problems that have already been experienced/worked through, then rules are really helpful. The challenge of management and in particular, senior management is that we face new situations, new challenges, new problems. So how do we need to react? Typically, our response to problems and crises is to define rules and procedures such that when the event occurs again then everyone will know what to do; this is fine if problems are predictable, the problem is that many are not. Let’s think of the role of rules in the successful business. Products and services require precise specification, as being able to replicate it is an important feature of most products and services, the customer needs to trust you to deliver your promise. This requires precise specification, not just of the product, but increasingly, how it was made. Are the ingredients and raw materials safe? Are they ethically sourced, has slave labour created it? These require rules and specifications that we need to make and enforce. But when it comes to management, can future actions be so well formulated? The whole mass of so called ‘management learning’ with all its contradictory ideas and recipes suggest not. Had an algorithm of management been put together then someone would have made a fortune and the management consulting market would have died. This, of course, does not stop us trying to put together new recipes for good management. In my many years in management consulting it strikes me that the most common solution to problems consultants examine is to propose ever more precise rules, processes and specifications. Governments too fall into this trap. We have an inquiry on X and before we know it, there is a new set of rules and codes. This is not to say that these are never appropriate answers. My point is that we unquestioningly believe that the solution to all complex problems is to specify how others will behave in similar circumstances in the future. What starts out as ‘new standards’ rapidly decay into ‘stifling bureaucracy’. 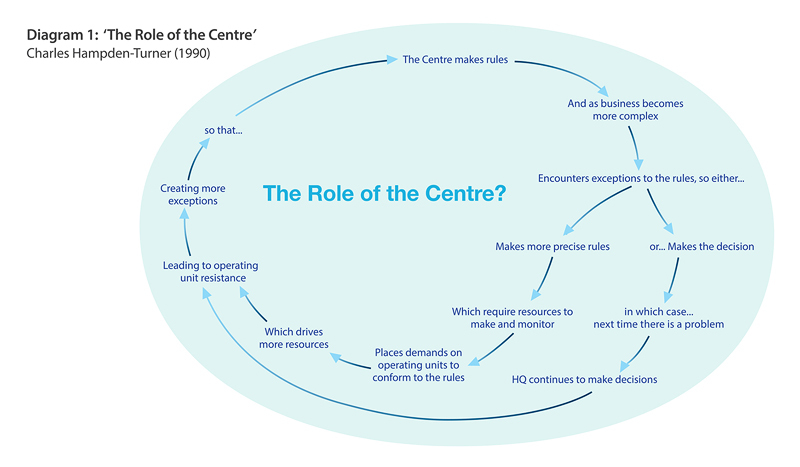 Let’s have a look at the often-contested question of what is the role of the business centre. As Charles Hampden-Turner (2) pointed out we easily get into the groove of thinking that running a business is like a complex piece of engineering, we just need to specify what we want and the rest is down to good communications. His spiral in Diagram 1 below typifies the train of thoughts that lead to ever-greater degrees of rules and policies. In working with many organisations I’m always fascinated by the density of rules that organisations create. When I worked with the UK’s postal service their operating instructions filled a small room. No human could ever comprehend them all; the message was that whatever the situation there must be a rule or procedure. Judgement was not encouraged. Other, highly successful corporations seem to thrive on a corporate rulebook of 50 pages. “The sea is bigger than we are: a force of nature we can never hope to control. You have to ride it, wait for the right wind, wait for the tide to turn, trust to luck and occasionally take a risk”. An army and a navy are fundamentally different. Good Generals do not make good Admirals. Napoleon, the greatest of all Generals, dismissed and disgraced Admiral Bruix when he questioned an order to sail his fleet. His deputy obeyed the command, although the wind was wrong: 20 ships were wrecked on the coast and 20,000 men drowned. The absolute obedience which a General can command is not appropriate at sea. The sea and the ships on it, do not obey orders in the way that armies do. Ship Captains have to be able to make their own judgements and take their own risks. 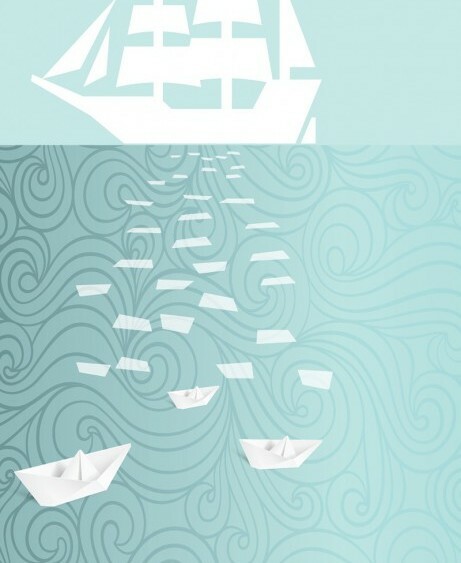 Leading complex businesses talks more to the Admiral than the General, more to the trader than the engineer – reading the winds, the waves and the currents, making sense from incomplete data and deciding action. 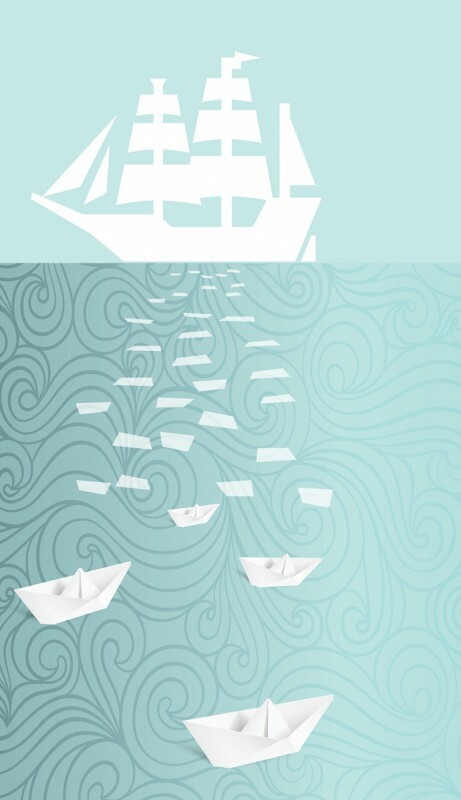 Sailing is a better metaphor for running a business than the set-piece battles of the 19th century. Netflix is one of a very small number of successful companies that has grasped the rule, procedure, process and bureaucracy nettle. The driver for Netflix is to get the best out of their people. The staff engagement movement, the idea of the inner worklife, all champion the idea that staff need freedoms to act to become more engaged, more aligned and more productive. • Firstly, rules are important but there is judgement required in business as to what extent rules can deliver performance. They are necessary but not sufficient. • Secondly, the more we set out the rules or process the less we use and develop judgement we substitute rules for wisdom. Too many rules are the enemy of judgement – codification, in fact, kills judgement. We have to break the cycle of ‘I keep on telling them how to do it but they still get it wrong’. Beware of the lazy manager whose currency depends upon the upholding of rules and processes. • Thirdly, innovation and creativity do not flow from a recipe. The effort that some organisations have put into ‘innovation processes’ rather misses the point. It is the flow of ideas, the lateral connections, the spirit for the unconventional that drives innovation. • Fourthly, the alternative to rules is to build the capacity and capability for thinking and judgement. It’s moving from the board that asks, “how are we going to resolve this problem?” to “how can we ensure we have the people in our business who can resolve these problems?”. The first leads to a new trail of instructions, the second builds the capability for enduring progress. The coaching culture is trying to make this shift – help people to think about the issues rather than giving them an ever more precise path to follow. We need to invest in developing managers to apply judgement within directional guidelines. How can I better build the capability to think about the problem and to use judgement to decide how best to achieve the result? Your framework of rules is a key driver of your organisation’s dynamics: have too few and you are liable to fall apart, have too many and you create reinforced concrete that prevents the growth of people and performance.